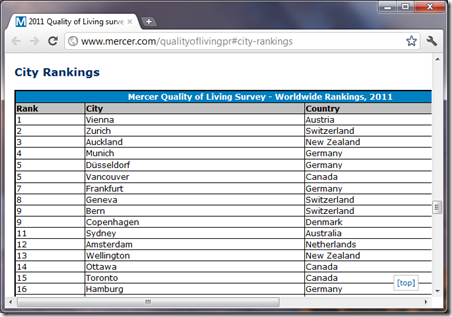 As reported by Le Temps end of November, it’s time again for the Mercer Quality of Living Survey 2011. No major change, this year, with Auckland and Wellington being in the overall top 15. The most obivous difference between Zurich and New Zealand cities is for us the ease of travelling. Not that Kiwis aren’t travelling, but it’s each time an journey despite Air New Zealand doing a fantastic job compared to almost all carrier here in Europe. The real point for us is the facility to visit Lucern within an evening, go to Basel during an afternoon or cross the alps and be in Locarno in less than 4 hours with the train. Same thing – with the high-speed train or the plan – for French, German or English cities.